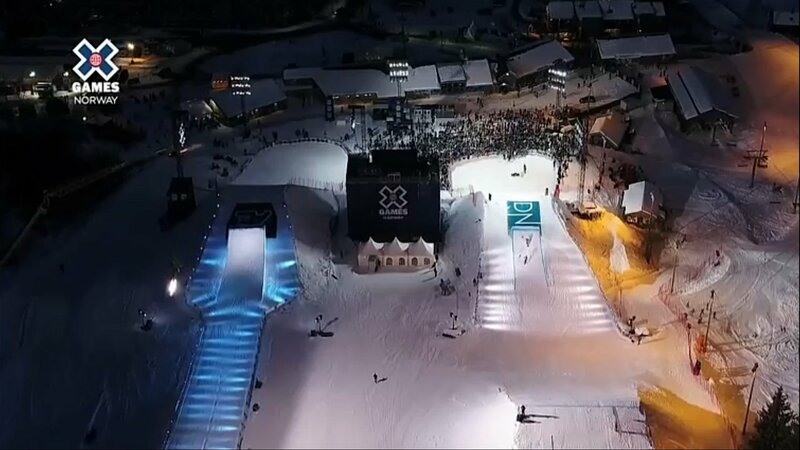 The men took to the slopestyle field in the aftermath of a speed-shortage hit women's final and managed to put on a decent show given the options they had. Their added weight and faster snow later at night meant they could clear the jumps with relative ease but you could still see the course was a limiting factor, particularly the jumps. The runs were largely very standard but clean, and Jossi, who was injured earlier was definitely missed as someone who generally provides a different style. Evan Mc started things off but sadly went down and then Andri had a small bobble on run one. He pretty much only spun left on the rails too which hit his score hard. McRae Williams came out swinging with a solid run. Dub 10s and 12s are pretty much the limits here but he was clean and stomped it. Oystein dropped an absolute hammer opening run with a lip on backslide and then superfed on the double feature up top, switch on misty out the drop rail, switch dub 10 to switch dub 12 to blind 990 out of the cannon to dub flat(ish) 9 at the bottom to take a 90.33 and a significant lead. Joss Christensen lost a shoe on the first jump before Gus went enormous on the jumps. His 270 to switch up top looked like it was meant to be a pretz 4 but he improvised and kept the run going, including a switch on 990 off on the cannon. He got hit hard on the score for some bobbles. Nick Goepper was super solid as he had been the day before: Switch 2 pretz 6 on the drop rail followed by all 4 ways dubs. Not the most interesting of grabs but good for 89 and second place. Woodsy put down a clean run too but his second part of the first rail feature, switch tails on 2 out, looked like it was meant to be more. It was good for 80.66 and fourth but he looked surprised to be so low. Neither Evan Mc nor Andri both could keep it together on run 2, with Evan taking a brutal crash coming up short on a switch dub 10 on the final booter. McRae Williams had a fairly stock run up top except for a switch 2 misty out on the drop rail, but he finished it off with a switch dub 14, the first 14 of the event. Slightly boosted his third place score but no more. 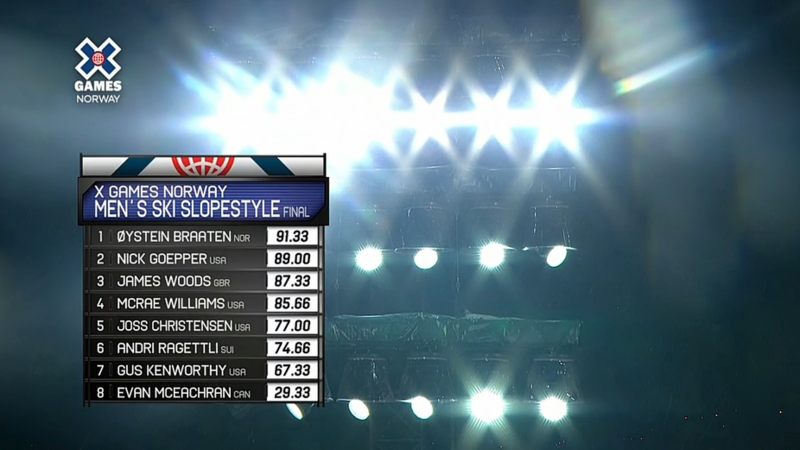 Oystein threw down again, same run but slightly cleaner for 91.33 and a small lead increase. Then it was up to the top four qualifiers to try and knock Oystein off top spot. First to try was Joss Christensen with a smooth but standard run: superfed, switch 2 pretz 2, switch right dub 10 to switch left dub 9, right dub 10, left dub 12, clean but not enough, provisional 5th. Gus Kenworthy had an insane run going on: 2 pretz 4, switch 2 pretz 4, dub 10, dub 12 and then crashed on the switch on 990. It looked like a winning run but tonight was not the night. Goepper only managed both ways 2on on the top rail feature missing his pretz 4 on the second part, switch 2 continuing pencil 810 on the drop rail and all 4 dubs... but the bobble killed the score. He stayed second. Woodsy, last to drop laid down an improved and super clean run. Switch 3 tap up top to switch tails 6 out, switch 2 continuing 2 on the long rail (the harder option), big dub 10, dub 12, switch 2 continuing 4 (shifty), switch dub 10 octo. He got 3rd for his efforts and I have no idea what people will think of that. It was far from a classic but Norway take 1st in both women's and men's slopestyle tonight and that has to be good for the local hype! Scaffolding jump, many spins, much stomp, and some controversy for good measure.